Upon walking into Music Hall of Williamsburg, it was easy to tell what kind of audience this venue attracted. It was a veritable sea of flannel, with thick-rimmed glasses aplenty, and varying amounts of facial hair. These were the hipsters of Brooklyn, all of whom had come flocking, on a Monday night, no less, to see Liam Finn. The show began with opening act Marques Toliver, who took to the small stage armed only with a violin and a voice so smooth it could be made of honey. And he caught a lot of flies with that honey, as he began his set with charming rapport and a truly unique sound. The classical sound of the violin blended, miraculously, into an R&B style, using only a kick drum and a stunning voice to complete the transformation. He left the stage with the crowd literally begging for more. As the crowd began filling out, with even more flannel plugging holes in the standing room, the next act, The Generationals, began their set. With a five-man band comprised of drummer, bassist, guitarists, and keyboard, the Generationals were able to achieve a fresh sound from a seemingly old as time configuration. The double vocalists were perfect together, and although the music was electronically-driven from the keyboard, the band had a distinctly rock and roll sound. These guys will no doubt be giving similar bands like Foster the People a run for their money in the near future. Liam Finn finally took the stage to a full house. He and his band did their own set up and sound check, due to a presence of instruments and sound systems that looked as though he and his band had invented them specifically for the show. Among piano, bass, 2 drum kits (one played by "[my] steed, Elroy" and the other played by Liam himself) and an electric harp, there was also what appeared to be an uncoiled symbol that later, percussionist and vocalist EJ, would play with a drum stick to make a truly haunting sound. Liam pumped up the audience while tuning with an air guitar rendition of Inside-Looking Out by The Animals as it played over the sound system. He opened the show with a very heavy, very rock and roll guitar riff as the band took the stage and joined in, setting the stage for the tone of the show and leading into I'll Be Lightning as the crowd cheered raucously. He played another old song before switching to Cold Feet, from his new recently released album entitled FOMO, and a clear crowd favorite. The new songs had a less heavy handed sound, an evolution from his earlier work and definitely a good direction to be moving toward. 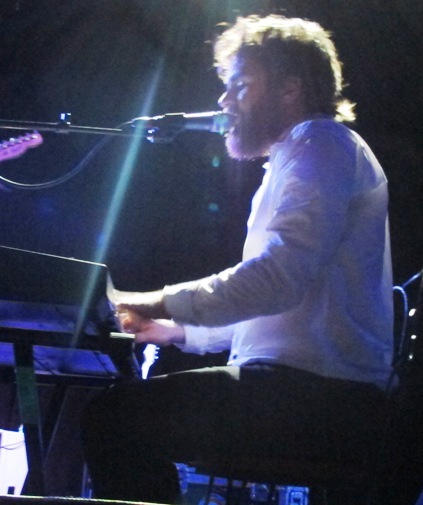 Switching to the piano for his next two songs, he played Neurotic World and Real Late, both new songs as well. He stayed with material from FOMO for a good part of the concert, but was still able to sneak in old favorites like Lead Balloon towards the end of the show. His performance style is that of a true rockstar, gyrating and jumping around the stage, sweat pouring off of him in buckets. It is refreshing and entertaining to see an artist really get into the music, and he had the audience captivated from the very first note. He and the band left the stage, before coming out to do a truly stunning encore, playing Jump Your Bones, This Place is Killing Me, and Gather to an awed audience who didn't want the night to end, so much so that they stood motionless, waiting for more, long after Liam and his band left the stage - truly rock and roll. The show began with opening act The Radical Dads, a trio that rocked Webster Hall with a big sound despite their lack of a bassist. With two guitarists and drummer, Robbie Guertin, who also played the keyboards in headlining act, Clap Your Hands Say Yeah, the Radical Dads achieved a sophisticated sound that drew on garage band rock and roll without being overwhelming or muddled. Their short set revved up the crowd, making way for the principal openers, Waters, to take the stage to a warm reception. Waters, comprised of two guitarists, a bassist, and a drummer, opened with an acoustic song that grabbed the attention of the raucous crowd, immediately quieting the hall as everyone listened contently. Trading in the acoustic for a beat up old electric guitar, lead singer, Van Pierszalowski, went on to fire up the crowd with spirited vocals and a personality to match. The set list included fan favorites, Back to You and San Francisco, the latter of which, Van explained, was inspired by his hometown. The between song banter charmed the audience just as easily as their catchy beats and alternative style did. Continuing with hits from their debut album, Out With the Light, Waters carried on impressing the crowd in the fully packed Webster Hall, infusing an edge of true rock n' roll recklessness into their stage presence with jumping and gyrations that kept all entertained. 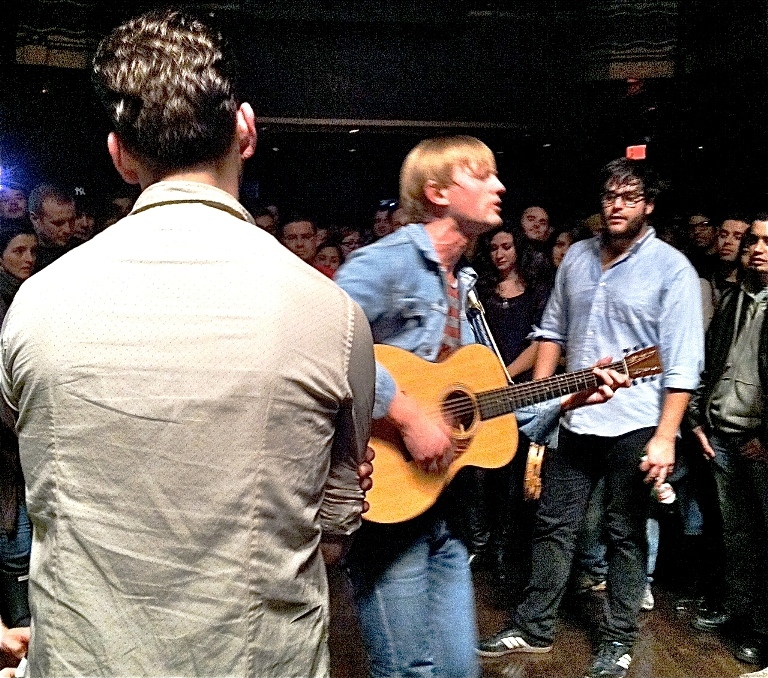 For their last song, all four band members jumped into the crowd, playing acoustic from within a circle of excited bystanders. Urging the crowd to sing along during the chorus, everyone from the floor to the balcony shouted "forever" along with the band through the duration of the song, a truly unifying moment. However, the lyrics of the verses were somewhat obscured by chatter, so the impromptu in-crowd performance might have been better received had a sound hook up been properly organized beforehand. Despite the reception to their rocky finale, Waters was cheered as they left the stage, leaving the crowd wanting more and thoroughly warmed up for headliners, Clap Your Hands Say Yeah.